"This is the recipe that my mom made when I was small. It is still one of my favorites. Some friends add a little green onion to the recipe. My kids and I just aren't raw onion fans. Enjoy!" Wow, this was too sweet for us. I ended up tripling everything but the sugar and it was still too sweet. This is an awesome recipe. 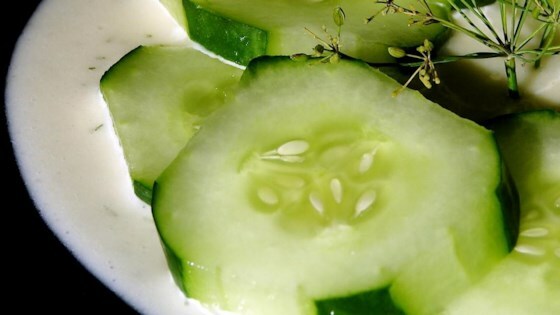 I had been searching for a good creamy cucumber salad recipe, and I found it! Of course, I added 1 sliced onion to the mix. It was great!